Abby Loebenberg is a Barksdale Fellow at the Sally McDonnell Barksdale Honors College at the University of Mississippi. Abby completed her doctorate in Social and Cultural Anthropology at the University of Oxford in 2011, where she was a Rhodes Scholar. Her research areas include: material culture, sociality and space and childhood. 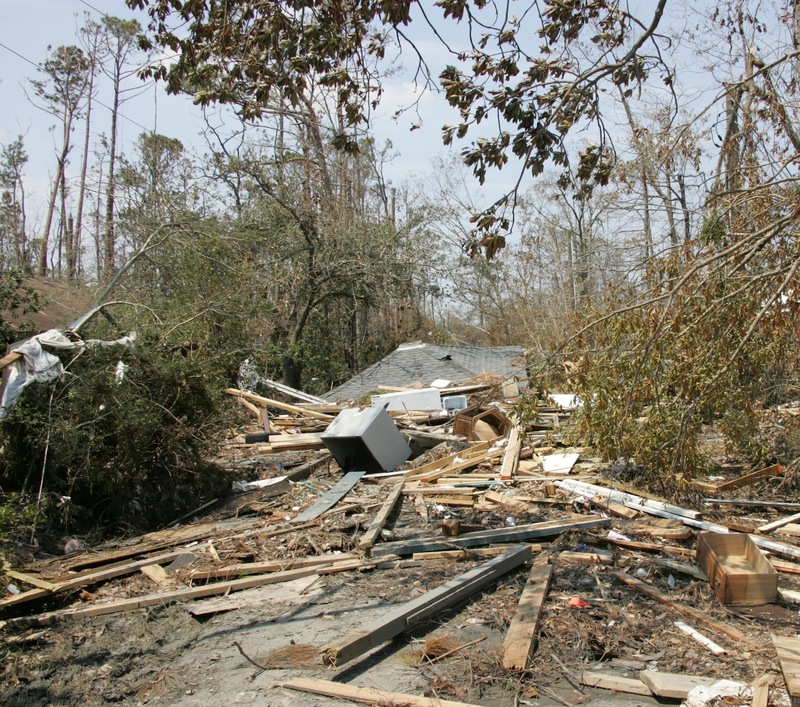 In this paper, written especially for Material World’s Occasional Paper Series, the authors explore critically the concept of the ‘disaster landscape’ with specific reference to the events surrounding Hurricane Katrina recovery in Waveland, Mississippi. Drawing heavily on the auto-ethnographic work of a Waveland native, the paper explores how the anthropology of landscape is engaged through memory. In this light, the paper argues that the concepts of ‘benchmarking’ and ‘breaking of the home’ have particular resonance with the collective and individual construction of place respectively. This goes to support a wider discussion of the importance of physical markers in grounding our relationship to time and space. The paper concludes that stark reality of complete disaster reveals the relevance of recognizing the cultural landscape in contemporary communities, both for personal, and collective recovery. We cannot help but feel that the word ‘loss’ is entirely too simple to describe the magnitude and complexity of the void left in the lives of those whose places of memory are reduced to spaces of rubble. This paper examines a town, marked and defined by the overwhelming destruction such a ‘loss’ entails. The Mississippi town of Waveland in the wake of Hurricane Katrina. In particular, the cultural relevance of landmarks and borders will be investigated, using an anthropological lens, to determine what happens to a space when its sense of place is both challenged and erased. This allows us to reflect on the socio-cultural consequences of a singular event that breaks and remolds the landscape into a different one, substituting new, harsh memories for the old, familiar ones. Oliver-Smith & Hoffman (2002) have argued, “disasters divulge matters of time and space use. They bring to the fore the power of place and attachment” 1 It is this power that is attached to the landscape. A landscape that due to human occupation may be argued to be, “considered inseparable from, and integral to, the day-to-day activities and values of its occupants” 2. In our vernacular, a ‘locality’ is often described to a stranger using physical geography as a tangible indicator for what exists in the present and what had existed in the past. Through such a method, ‘locals’ are able to shape the geography of an area into a socio-historical or spiritual landscape held together with ‘landmarks’ holding specific meanings. Landmarks act as both cultural touchstones and are incorporated into oral tradition as a connection to the past and guide for the future 3. Landmarks, materially, are key to the way people make the landscape local and are inherently representative of how the landscape has made them. This relationship is so familiar, that it is imperceptible. That is, the landscape often, in day-to-day reality, seems to be a container for activities, rather than the actively-shaped cultural world that Basso 4, Cruikshank 5, and Morphy and Flint 6 have argued it to be. However, when a tremendously destructive event occurs, the familiar landscape physically becomes a tabula rasa, revealing how, while the landscape may shape many of the material aspects of a culture, more than anything the landscape shapes the collective memory. While Casey made the argument that it is “our inevitable immersion in place and not the absoluteness of space that has ontological priority in the generation of life in the real” 7, he de-emphasizes the temporality and, sometimes, temporariness of place itself. A culture that remains in the same physical space but is faced with the removal of its sense of place finds itself fighting to maintain the integrity of its sense of self. One example of this lost place is the post-disaster landscape. While the normal context of the landscape was one that was a product of the inhabitants’ collective understanding of place, the post-disaster landscape forces new social roles that re-shape the ghostly after-image of the landscape, into a new physicality and materiality born of necessity. Although all landscapes, like culture itself, are not static and are subject to change 8, the landscapes themselves provoke a palimpsest of competing memories made concrete as salvage and re-construction attempts to rebuild a sense of place and self. When disasters occur, human intervention may naturally follow. These interventions can take the form of relief groups setting up distribution centers to that of emergency aid workers bringing in heavy equipment to clear roads or set power-lines. As Bender has noted, these interventions are “done not so much to the landscape as with the landscape, and what is done affects what can be done” 11. The disaster ‘culture’ that exists following a storm is one of both attachment to the past and apprehension of the future. While people are emotionally bonded to the memories of the landscape, there is a fear of not being able to recover what was lost, or even worse, completely losing the sense of place. A landscape so filled with memory “serves to draw people towards it or to keep them away, permits the assertion or denial of knowledge claims, becomes a nexus of contested meaning” (Ibid). Hurricanes are one of the most destructive natural forces on earth. 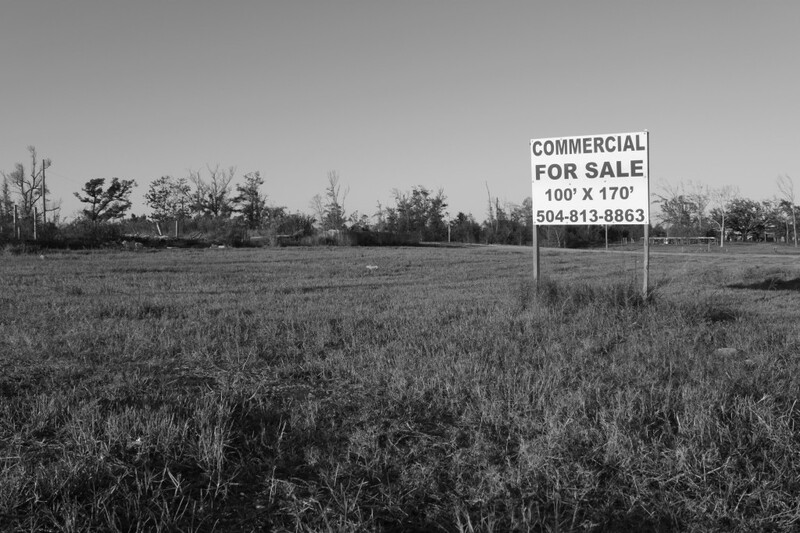 In Waveland, Mississippi, we estimate that 95% of homes and 100% of businesses and government buildings were destroyed after Hurricane Katrina. It is somewhat ironic to note, that the word hurricane is itself representative of a culture that no longer exists. The word is one of the few remaining from the decimated Tainos tribe of the West Indies who called their god of evil, Huracan 12. The Huracan was said to have been “a natural phenomenon of such violence as to be unnamable in any European language” 13. In historical anthropology, such as Evans-Pritchard’s work with the Azande 14, these types of enormously destructive natural forces are often attributed the status of the supernatural, where social order is predicated on appropriate rituals to placate said forces. Destructive, life-threatening events can thus be assimilated into a socio-natural order by the claim that these rituals were incorrectly performed, and thus the god’s reaction with anger, warranted. In today’s parlance, these events too, are often called ‘acts of God’. On the 29th of August 2005, the small coastal town of Waveland was marked as the ‘ground zero’ of Hurricane Katrina by the National Weather Service. The storm’s thirty-six foot surge destroyed all of the town’s major infrastructure including buildings, roads, and bridges. The trees that had marked the town’s leafy streets were stripped away creating a haunting scene which was described by many as “worse than a war zone.” Remnants of homes were lefts perching over twenty-foot up in those trees with established enough roots to hold fast against the driving water. Not only is land an important asset and a symbol of individual livelihood in this town, but its loss, and the loss of public assets threatened livelihood on the most basic level. While the destruction of the town was devastating, the destruction of landmarks virtually erased the history of Waveland. [caption id="attachment_6023" align="aligncenter" width="640"] Bradford, Sabrina. The American Legion. Waveland, November 2011. When seen through an anthropological lens, the disaster was not only a loss of physical locations, but the re-figuring of landscape itself illustrated of the power of the interrelationships between culture and landscape. That is to say that, the loss of landscape inspired a fear of rootlessness, that the loss of property would have meant a loss of history and that the loss of landmarks, meant a loss of community. I chose to use auto-ethnography as the story of Waveland is so intricately involved with my own life. The conflicting feelings about landscape and memory in a disaster landscape is something that I believe is necessary to examine, even though there exists a lack of informants that were residents of Hurricane Katrina’s “ground zero” before, during, and after the storm. On a Google search the phrase “New Orleans Katrina” surfaces 25.4 million hits while the phrase “Waveland Katrina” only yields 168,000. Of course, if one went by media-coverage alone, one would be tempted to say that New Orleans was most severely hit by Hurricane Katrina. If one looked up the facts, they would realize that the levees in New Orleans flooded it from the north. That New Orleans had the weakest side of the storm. And that if the Mississippi coast had been lucky enough to have been hit by Katrina’s northwest quadrant, we would have been safe. I have never had training in meteorology or the science of hurricanes; however as a coastal native, learning hurricane tracks and patterns was part of growing up on the coast. When one lives in a place where six months of every year is hurricane season, it does not take long for even a child to learn the significance of mercury measurements and hurricane maps. Hurricane Katrina was different than the storms of the past, whereas most Hurricanes we are able to see develop and move over weeks, Hurricane Katrina became a monstrously large hurricane in a matter of days. To make matters worse, the track was uncertain- at one point the meteorologists repeatedly claimed it was likely to hit Apalachicola, Florida, and at another point they said it would go to Lake Charles, Louisiana. Of course, hurricanes always seem to right hook at the end, which led Katrina straight through Waveland, Mississippi. 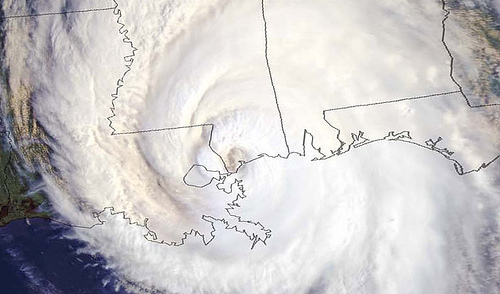 In the following video, the first in a series of three that supplement this paper, Bradford explores the nature of the forecast and aftermath of Katrina. Bradford continues: When I say I am from the coast of Mississippi, the question “So were you affected by Katrina?” always arises at some point during the conversation. If I say the name of my town one of two responses results “I’m sorry” or “I have no idea where that is.” The understanding of the general public of what my town is or was is symbolic of the entire disaster and recovery process. As stated by town alderman, Brian Schmitt during an interview with BBC News (2005), “There is not a ‘Waveland is being somewhat neglected.’ It is just a very small dot on the map, but there is no place that is more devastated than here” 17. No different than any other old coastal town, my town of Waveland, Mississippi had families that had lived there for generations, families that knew each other so well that there was really no distinction between blood relatives and friends, everyone was treated the same. I attended a small elementary school with only twenty-three students in my class. It had what may be seen as an archaic learning system, with only one teacher per grade. I was able to walk down any main street in town with people knowing exactly who I was. To fully understand Hurricane Katrina and the effect that it had on my town one must rewind to a similar event that occurred almost forty years before. On August 18, 1969 Hurricane Camille, the strongest Category 5 hurricane to ever hit the United States, hit Waveland Mississippi. With wind gusts greater than 200 miles per hour Camille flattened most of the town; however, her storm surge never crossed the railroad tracks, which acted as a levee a mile from the beach. My father is a doctor and rescued many people during this hurricane. As a doctor that specializes in emergency medicine, a native of Waveland, and a former firefighter, he has felt it to be his duty to remain with his town throughout every hurricane and ensure its recovery. While it may seem strange to someone that has never been through a hurricane, most people on the coast ignore mandatory evacuations because in reality it is a hassle. Tropical storms through Category 3 hurricanes are viewed as glorified thunderstorms and a well-built house would stand through a Category 3 or 4 with no problem. 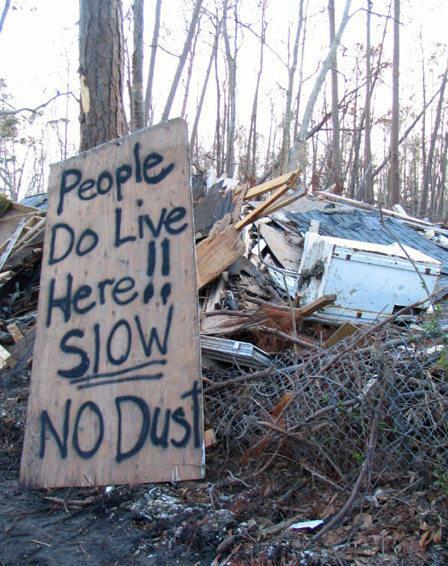 In fact, Hurricane Katrina is the first hurricane that I can remember people actually taking evacuations seriously. The people of the coast may be known for their easy-going demeanor but they are not ignorant of the threat presented by a catastrophic storm. 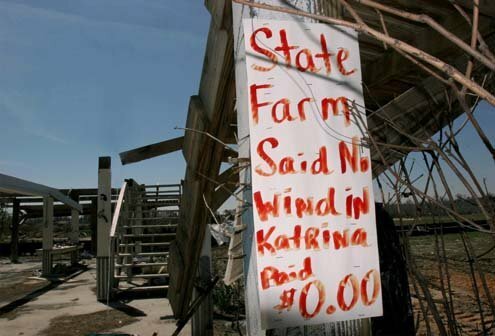 When Hurricane Katrina was predicted to be a Category 5 storm, people evacuated as soon as possible. The only people that stayed for the storm were a few hurricane veterans in well-built homes, primary care providers, city employees, the police and fire departments. In addition to these groups some people could not afford or did not have the means to leave. Lastly, some people felt forced to stay because of hurricane shelters refusing their pets. Since both of my parents are primary-care providers, my family did not evacuate for the hurricane. My family had never evacuated for a hurricane and we had the necessary emergency supplies to last for several weeks, if needed. My two-story home is a mile from the beach and at 18 feet above sea level and my father was certain that we were in little danger of surge on the northern side of the railroad tracks. My godfather, who also grew up in Waveland, drove from New Orleans to stay at my godmother’s house with eleven other people and brought a dozen life-vests as a joke. The company at that house included two senior citizens that were over ninety years old, and five of his twelve siblings. The evening before Katrina was scheduled to arrive my family had a traditional “hurricane meal” where every meal that could possibly be cooked was cooked in anticipation of the power outages that would follow the storm. We lost power at around 10pm on August 28, 2005. At 8:32am, our home flooded with 13ft of water within ten minutes. The tracks had been breached by an unprecedented surge that no one had predicted. In James Scott’s ethnographic work he emphasizes the relational value of local measurements. The importance of recognizing that any request for a judgment of measure allows a range of responses depending on the context of the request is a reflection more so on the local language customs of the area than standardized international measurement systems. An example used by Scott collected in a Malaysian village in which he conducted fieldwork. If one were to ask “How far is it to the next village?” a probable answer would be “Three rice cookings” 18. In the answer, it is clear to see that the person responding assumes that the questioner is interested in how much time it would take to travel, rather than the mileage to get there. The reason behind a time rather than distance measurement reflected the region itself, which had varied terrain, and the time it would take to cross it. In such terrain, distance in miles would be unhelpful at best, especially if a visitor were on foot. “This is Katrina’s Ground Zero,” he says. “When you look at the rubble, it is total devastation. Everything south of the railroad tracks is just gone” 21. In the case of hurricanes, the railroad tracks had always served as a measurement of the strength of a hurricane. The people of Waveland believed that no storm was powerful enough to push a surge over the railroad tracks and the breaking of this benchmark had deadly consequences for many residents. This marker is representative of the notion that, in experience, ‘measurements’ are often flexible and relative to collective memories and experiences. The question of “How high was the water on the tracks?” is a custom of measurement that is “situationally, temporally, and geographically bound” 22. Yet, the understood benchmarks in Waveland were not only used by residents to determine if an evacuation would be necessary, but were also used by insurance companies for flood zoning purposes. Only a small portion of Waveland was zoned for floods (mostly properties below the railway line), and so most residents did not have flood insurance. As a result, the consequences of the hurricane were not only the loss of their home, jobs and town, but few residents received any kind of monetary compensation. Isbell, Tim. “Homeowner Frustration.” March 2006. My family lost everything in the storm except for our lives. We literally watched the landscape of our memories swept away. A pier floated by that I used to fish on, homes floated by that I used to visit, signs and debris from city businesses followed. We felt our home shudder as other homes and debris were swept past in the surge’s current. Frankly, I had no doubt that our home would collapse soon and we would be swimming for our lives. Our home stood through the storm. The surge blew out every door and window on the first floor and the eye passed over Waveland when the water was less than a foot from breaching the second floor and dismantling the house. After eight hours from the start of the surge, the water had fully receded. The landscape outside was not recognizable by sight, the trees were almost completely gone and the area was coated with thick mud, trees, and buildings. Bradford, Judith “Street Debris.” Waveland, 3 September 2005. The environment within our home was not homelike at all, the same items appeared in the home as outside, if not more painful. Splotched papers appeared on the walls where family photos had been and pots were stuck to the ceiling while pictures my siblings and I had drawn as children remained attached to the front of our refrigerator, which had made its way into our living room. The smell of chemicals and mud had replaced the smell of the home; the smell of rot and decay replaced the smell of the town. The sounds of the fishing pier and the main road of the town were silent for the first week before aid arrived. After emergency workers appeared the sounds were replaced by chainsaws and occasionally gunshots, probably shot as warnings to looters. The landscape had been completely transformed. While the losses resulting from a system based off of traitorous benchmarks that crippled Waveland economically, the most difficult loss the town confronted was a loss of itself. People had created their sense of self and belonging through their life and memories in the town. The stories around places, the sight, sound, smell and touch were all involved in the resident’s definitions of the town. The hurricane destroyed all paths, whether it was a road or a trail through the woods. The storm changed the collective memory of the town by forcing town elders that were too old to rebuild to leave the town permanently, taking their knowledge with them. The smell of a fishing pier and salt water was replaced by the acrid odor produced by the thick mud that coated all of the rubble. This landscape at forced its way into the lives of the residents and through all of their senses. Disasters force people to interact with the landscape that they knew and the landscape that had changed. In no other scenario is the relationship between people and landscape as painful and meaningful as that after a disaster. In trying to recover the landscape, people are trying to recover themselves, their sense of place. The sense of place was essentially erased by the storm. One may suspect that many residents did not choose to return to the city because of the anxiety produced by feeling lost in a place so familiar. The transformation from sleepy constancy, to the whining and crunching sounds of recovery operations turned Waveland into what Bender refers to as a “landscape of terror” 24. The quiet little town with few visitors and even fewer locked doors became a war zone with martial law in effect and residents sleeping with guns to protect themselves from looters who had made their way from across the country to steal from those left with nothing. National and international media amplified this problem by failing to realize “that there are times and that there are landscapes that are beyond words…there may be times or contexts when people’s memories, wound around particular places, are too raw, too private for the outsider to intrude upon” 25. While Waveland’s existence and story as a town was largely ignored in favor of that of New Orleans, recovering residents seemed to be fair-game for members of the media that were simply looking for a story. Rather than being left to mourn the loss of their town, residents were terrorized by countless interviewers, psychologists, even sociologists seeking to get a closer look at disaster phenomenology. The hurricane itself may have destroyed Waveland’s sense of place but it was the perception of violating outside influences pouring into the town that created a landscape of terror. Outsiders’ influence further changed the landscape by physically modifying the wreckage of the hurricane. Every piece of a home that could be found was searched for bodies and was marked with an X on the exterior with information regarding how many bodies were found and what hazards were found. The presence of these Xs they were described by one New Orleans resident as “threatening in mystery,” especially when chalked on structures that the observer knew personally 26. The marks were found in every area affected by the storm, with even slabs marked with an X in the absence of a house to search. The marks represented the ownership of search crews over the disaster-landscape and the affirmation of their discoveries or lack thereof. Further, their modifications came to represent the questioning of the safety of those places that had been shelter and home. The fear and anxiety that follows the loss of familiar surroundings can be sourced from the fear of losing oneself when a place disappears. Part of creating a place is the memories infused into the material world, whether it is the landscape, or objects in the home. Traditionally, when the elderly separate from their belongings, usually through being moved into a smaller living facility, what Marcoux 27 refers to as the “Casser Maison ritual” occurs. This ritual is described by Marcoux as the “breaking of the home” as a result of a residential movement, usually that of an older family member moving into an assisted living situation where only a selected number of their things can follow. The ritual elements Marcoux describes involves the importance of finding a ‘good’ new home for these objects in order to psychologically satisfy the ageing family member that they themselves will live on through their things. Applying these principles in the disaster-context highlights how objects of value that are destroyed completely, or worse, are left irreparably damaged, damage a part of the self. In this way these objects have no place in the landscape and must either be disposed of, or removed to ‘safety’. Waveland’s residents were left to grieve by picking out mementoes as they “gutted” the shell of their home or cleared their slabs. The gutting process was characterized by the shoveling debris and, usually composed of mud-covered sheetrock, insulation, destroyed photo albums and mud caked possessions, items that previously had marked places in the home. If the shell of the home was gone, the slab would also be cleared using a similar method. Both processes were long and slow, mostly as a result of the homeowner’s futile attempts to recover objects that held deep meaning. Although many objects were rendered economically valueless by the salt-water surge, as mementoes the items still held strong value to their owners. The objects, and their placement within the homes acted as markers to bring forth memories, making possible a present past. These mementoes had their intrinsic value strengthened even further with residents mourning the loss of their most fragile and treasured material possessions: their photographs. While most photographs were reduced to splotchy pieces of paper by their exposure to water, many of the surviving mementoes found themselves floated far out of place and subject to wholesale disposal. A limited amount of time was given to these private processes before the removal of the ruined images and objects became a part the wholesale cleanup designed to create public order out of everything that was so out of place. This became the instrumental clearing of objects that had been so severely altered that they no longer had a place in the rebuilding process. This necessary evil allowed for the rebuilding process to occur with new classifications for unaltered, unbroken items. The removal of the broken objects became, psychologically, a way to remove the visible effects of the hurricane, and so restore broken families and selves into an outward semblance of healing through forgetting. My generation is the last that will remember the town that, six years later, is still mostly concrete slabs. As we were the ones that placed the value in the landmarks and landscape, it will not be possible for those in my generation to explain to those younger the value of landmarks that no longer exist. Sometimes it is easier to go to the parts of Waveland that are still rubble rather than the parts that are being rebuilt simply because it still has the slabs of the buildings. While to an outside observer these appear to simply be the slabs of buildings, to anyone from my town they are haunting skeletons of a life we used to know. It may have been the city hall where the town citizens broke the Guinness Book of World Records for caroling or the convent where the Dominican sisters lived. It may have been the old drugstore where the pharmacist gave children free ice cream or the pier where fishing rodeos were held. Once these skeletons have been cleared our last landmarks will have vanished and it will have all been forgotten. The reader is here invited to move through the changed landscape of Waveland in this final video, tracing a route around the town Bradford remembers from childhood 28. Although the landmarks and benchmarks of Waveland may have been over-written, the place still exists. The destruction of the physical structures and the rebuilding efforts have revealed that the town itself was defined by the spirit of the people. The town has never been wealthy and eighty percent of the residents over twenty-five do not hold a college degree. However, many families have lived in Waveland from the time that their ancestors immigrated to the United States and will continue to hold on steadfastly. In spite of all of the destruction, the genius loci of Waveland made real in the tenacity of its people, has not changed. Since Hurricane Katrina, the town has faced oil spills and the recession, but the spirit has remained the same 29. If anything, the case of Waveland should demonstrate how much a place is defined by the day-to-day rituals that form its living culture rather than its physical history 30. What happens to a space in the absence of place? It seems, if given the chance, over time, the space will once again be inhabited by the place . Bradford, Sabrina. “People Live Here.”2009. Thank you for reminding people of what happened to Waveland. 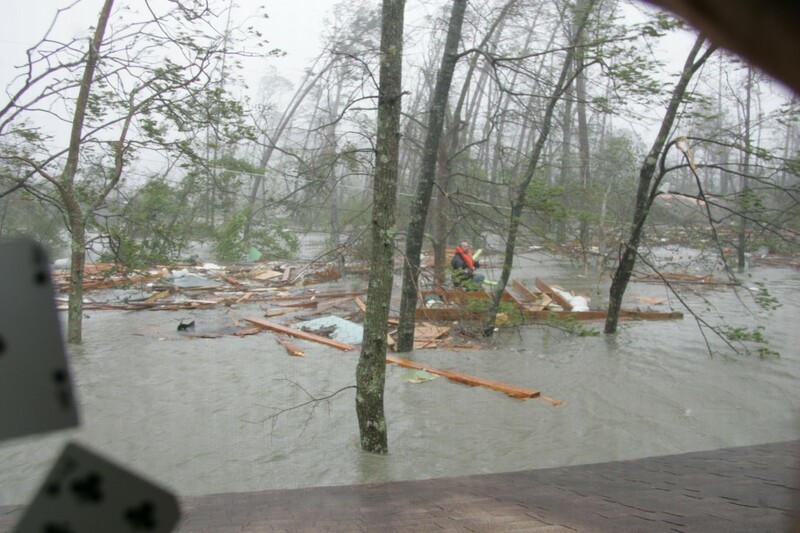 When I brought a friend by to meet the family in 2008, he commented that he “had no idea.” He was amazed that there was still debris and the level of destruction still evident. The storm allowed me to understand visiting the Hiroshima Peace Memorial in a way none of my friends, even the Japanese with us, could grasp. Everything- your possessions, friends and entire personal history- was wiped away.